The 1973 World Energy Crisis has been introduced as the starting point for the sick building syndrome (SBS) phenomenon. The consequences of this crisis include the effort to maintain energy through the installation of UPVC windows, reducing the number of building air changes, partitioning rooms, and removing the natural ventilation by introducing ventilation systems based on air recirculation and demographic load increase in the building. In addition to the factors mentioned above, the entry of equipment such as computers, photocopiers, laser printers, and many other equipment into office environments has led to the emergence of new pollutants inside the building, which worsened the situation. However, perhaps the rise in the price of energy carriers after the 2011 Targeted Subsidy Law and the pollution of the major cities has been one of the most important factors in increasing the prevalence of the SBS in Iran. The SBS is an uncertain condition with symptoms of headache, inflammation of the eyes, nose, throat, and skin, cough, dizziness, nausea, and fatigue. These symptoms quickly disappear after leaving the building. Indoor air quality in the late 20th century has been considered as one of the most important factors in the development of the SBS. Many studies have also been conducted in this regard. Inappropriate ventilation, such as ventilation systems based on air recirculation, reducing the number of air changes per hour from 2 to 0.2 or 0.3 due to air pollution and the use of UPVC windows can be considered as effective factors in reducing the air quality of buildings. One of the most important indicators that can be used to measure the parameters affecting indoor air quality is the measurement of carbon dioxide (CO2) concentration. Despite the fact that CO2 is not a pollutant gas and does not have any effect on human health, it is always considered as an important factor in evaluating indoor air quality and as an indicator of how the ventilation system works. According to the report of American Occupational Safety and Health Administration, if the concentration of CO2 in closed environments is higher than 800 ppm, it will cause a feeling of lack of fresh and still air. The usual range of CO2 concentration in the closed environments is 450–675 ppm. Bad air quality in rooms leads to fatigue, lack of concentration, and dissatisfaction of people, often due to improper ventilation of the building. This has a direct relation with CO2 concentration; therefore, in some systems that use automatic ventilation, CO2 concentration is used as a measure of the regulation of fresh air entering the system. Excessive CO2 increase can cause becoming sick, headache, increased sweating, and difficulty in breathing. Previous studies have shown that increasing the concentration of CO2 in office environments increases the prevalence of the SBS symptoms such as headache, dizziness, eye symptoms, and respiratory symptoms. Considering the fact that, in many studies, complaints of the SBS were more common in the office environment, the present study has been conducted aimed to investigate the relationship between the SBS and concentration of CO2 in office environments. This cross-sectional descriptive study was conducted in 2011 on workers of the two buildings of Petroleum Industry Health Organization located in Tehran. The study inclusion criteria included no illness such as cold or other illnesses with symptoms of the SBS, with a work experience of at least 1 year. Smoking and noncooperation until the end of the study were considered as the exclusion criteria of the study. The workers of the building No. 1 during the 8 h shift included 85 workers. The heating system of this building works through the fan coil. The ventilation system in the winter is only the natural ventilation. The building windows were not UPVC. The workers of the building No. 2 during the 8 h shift included 122 workers. The heating system works through the radiator. The ventilation and windows of this building are like the building No. 1. An integrated questionnaire used in the study of SKOV (1987), FANGER (2000), and HSE in England was used to study the symptoms of the SBS. The questionnaire included personal, occupational, working conditions, and symptoms of the SBS such as mucus, skin, headache, and nausea. The questionnaire was prepared and reviewed by experts and after studying the validity and reliability was distributed among the workers and collected at the end of the day. The CO2 concentration parameter was measured by the direct reading device of CO2 METER-1370 (NDIR) model over a period of 2 weeks in January. The data were analyzed by software SPSS version 16 (IBM, New York, United States) using Chi-square and independent t-test. More than 94% of the total number of workers of the buildings No. 1 and 2 completed questionnaires. The average age of men and women in the building No. 1 was 40 ± 9 years and 33 ± 5.7 years, respectively, and the average work experience was 7 ± 2 years for men and 6 ± 3.7 years for women. In the building No. 2, the average age of men and women was 38 ± 9 and 32 ± 6.3 years, respectively, and the average work experience was 6 ± 3.7 and 6 ± 3.1, respectively. The results of measurement of CO2 concentration showed that the average concentration of this gas in the buildings No. 1 and 2 was 700 and 740 ppm, respectively. The allowed limits for CO2 condensation in office buildings are 450–675 ppm. The gas concentration in both buildings is higher than the standard limit. The results of the study showed that the highest prevalence percentage of symptoms was in women and men population in the building No. 1 was related to the sickness (feeling bad) and for women (84%) and men (71%), respectively. The lowest percentage of symptoms in women and men population in this building was dry throat (18%) and asthma (18%), respectively. For the building No. 2, the highest prevalence of symptoms among women and men was related to headache (72%) and sickness (62%). The lowest prevalence of symptoms in this building for women was related to wheezing chest (15%) and cough with sputum (15%) and the lowest prevalence of symptoms for men was related to cough with sputum (15%). Most of the symptoms of the SBS were higher in female workers than male workers. 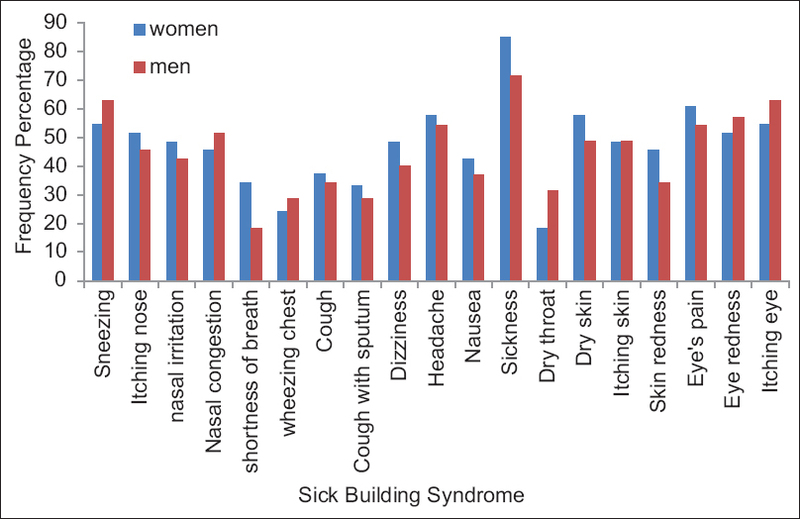 [Figure 1] and [Figure 2], respectively, show the prevalence of the symptoms of the SBS among men and women working in the buildings No. 1 and 2. The results of the evaluation of the relationship between the symptoms of the SBS and the concentration of CO2 in each building showed that a significant relationship was found between increasing the CO2 concentration and prevalence of symptoms such as nausea, headache, nasal irritation, shortness of breath, dizziness, sickness, and throat dryness (P < 0.05). [Table 1] shows the prevalence of the symptoms of the SBS and its relationship with the CO2 concentration for the workers in the buildings No. 1 and 2. This study has been conducted aimed to investigate the relationship between the SBS and CO2 concentration inside two buildings of Petroleum Industry Health Organization. The results indicate that the highest percentage of symptoms in men and women in the buildings No. 1 and 2 is related to sickness (feeling bad) and headache, respectively. The lowest percentage of symptoms in these buildings is related to dry throat, shortness of breath, wheezing, and cough with sputum. It was also found that most of the symptoms of the SBS in female workers are more than male workers. This finding is consistent with the results of Skov et al. Furthermore, in the study of Kholasezadeh et al., the frequency of symptoms of the SBS in the women population was more than that of men. In a study by Brasche et al. conducted in one of the European countries, the prevalence of symptoms of the SBS in women was 1.5 times more than that of men. Furthermore, the results of measurement of CO2 showed that the average concentration of this gas in the buildings No. 1 and 2 was 700 ppm and 740 ppm, respectively. Regarding the allowed limits for CO2 in office buildings, the gas in both buildings of the ministry is higher than the standard limits. Various studies have shown that high concentration of CO2 is not only related to air conditioning but also to population (the number of workers). There are 122 workers in the building No. 2 and there are 85 workers in the building No. 1, as well as because of the closed space and a low number of windows in the building No. 2, and in contrast, high air flow rate in the building No. 1; in this regard, CO2 concentration in the building No. 2 is greater than the building No. 1. This finding is consistent with the results of a study conducted by Burke (2004) in the United Kingdom and suggests that, in the buildings with mechanical ventilation, the prevalence of symptoms of the SBS is higher than that of the natural ventilation, which the main reason is the high concentration of CO2. Furthermore, in a review of 22 studies on the relationship between the building ventilation and CO2 concentration in a building with the health, comfort, and productivity conducted by Seppänen et al., according to studies available on air-conditioned buildings, but not natural-conditioned buildings, a statistically significant positive relationship was found between SBS symptoms and CO2 concentration (70%). The results of this review are consistent with the results of the present study. Furthermore, statistical analyses showed that a significant relationship was found between symptoms such as dizziness, headache, nausea, nasal irritation, shortness of breath, throat dryness, sickness, and CO2 concentration. About half of the studies in the review by Seppänen et al. showed that a significant relationship was found between the level of CO2 and SBS symptoms including headache, fatigue, eye symptoms, nose symptoms, and respiratory symptoms (P < 0.05), which is consistent with the results of this study. The study by Norbäck also produced similar results, with an average of 993 ppm CO2 (674–1450 ppm) and symptoms such as significant eye, nose, and throat discomfort, shortness of breath, headache, and fatigue observed in higher CO2 and temperature. However, in Chung-Yen Lu study, complaints of eye and nonspecific symptoms were the most common symptoms of the SBS in women and men, and peripheral CO2 levels in this study were not related to SBS. Chung-Yen Lu study also showed that the symptoms of SBS increased among workers in high-rise buildings and had a stronger relationship with CO2 concentration than the concentration of total volatile organic compounds in their office. The concentration of CO2 in office units was measured from 467 to 2800 ppm on a scale. This study showed that the risk of dizziness and fatigue increased by 14% and 20%, respectively, which is related to CO2 level. No relationship was found between CO2 and respiratory, eye, and skin symptoms. Due to the increased CO2 level of the environment, CO2 level in the blood may increase, and the level of oxygenated hemoglobin reduces, which leads to a shortage of oxygen, which may explain the relationship between CO2 and the complaint of fatigue and dizziness. The relationship between CO2 and SBS symptoms in Apte study on 41 US office buildings shows that, after adjusting the confounding variables, significant relationships were found between the symptoms of the lower respiratory tract and the increase in CO2; CO2 increasing by 100 ppm increases the likelihood of symptoms of sore throat, nasal irritation, sinusitis, chest tightness, and wheezing by 1.1–1.5. This chance (odds ratios) varies from 1.1 to 1.2 in Erdmann and Apte studies for symptoms of dry eye, sore throat, nasal irritation, sinusitis, sneezing, and wheezing with an increase of 100 ppm CO2. The results of our study indicate that CO2 concentration in both buildings is higher than the allowed limit. The results of the evaluation of the relationship between the symptoms of the SBS and CO2 concentration in each building indicated that a significant relationship is found between increasing CO2 concentration and prevalence of symptoms such as nausea, headache, nasal irritation, shortness of breath, dizziness, boredom, and throat dryness. Given that the ventilation requirement is 10 per se cond per person, reducing the population in the building or increasing the natural ventilation can reduce the concentration of the gas and consequently reduce the symptoms of the SBS. Jafari MJ, Khajevandi AA, Mousavi Najarkola SA, Yekaninejad MS, Pourhoseingholi MA, Omidi L, et al. Association of sick building syndrome with indoor air parameters. Tanaffos 2015;14:55-62. Jafari MJ. Khajevandi AA. Najarkola SA. Pourhoseingholi MA. Omidi L, Zarei E. Symptoms of sick building syndrome in office workers of petroleum industry health organization. J Occup Hyg Eng 2015;2:66-76. Seppänen OA, Fisk WJ, Mendell MJ. Association of ventilation rates and CO2 concentrations with health and other responses in commercial and institutional buildings. Indoor Air 1999;9:226-52. Syazwan Aizat I, Juliana J, Norhafizalina O, Azman Z, Kamaruzaman J. Indoor air quality and sick building syndrome in Malaysian buildings. Glob J Health Sci 2009;1:126-36. Lu CY, Lin JM, Chen YY, Chen YC. Building-related symptoms among office employees associated with indoor carbon dioxide and total volatile organic compounds. Int J Environ Res Public Health 2015;12:5833-45. Khajevandi AA. Evaluation of Sick Building Syndrome, Individual Characteristics of Employees, Environmental Factors Inside Central Buildings of Ministry of Oil and Health Organization. [thesis]. Tehran: Shahid Beheshti University; 2011. Skov P, Valbjørn O, Pedersen BV. Influence of personal characteristics, job-related factors and psychosocial factors on the sick building syndrome. Danish indoor climate study group. Scand J Work Environ Health 1989;15:286-95. Kholasezadeh G, Mirmohammadi Meybodi S, Mehrparvar A, Tafti F, Abedinzadeh M, Nourani Yazdi F. Assessment of sick building syndrome among office workers in Shahid Sadoughi University of medical sciences in 2008. Iran Occup Health 2011;8:70-6. 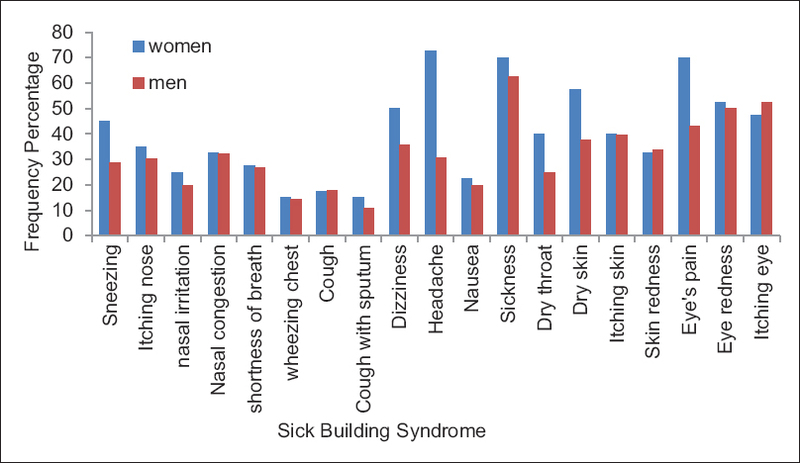 Brasche S, Bullinger M, Morfeld M, Gebhardt HJ, Bischof W. Why do women suffer from sick building syndrome more often than men? – Subjective higher sensitivity versus objective causes. Indoor Air 2001;11:217-22. Ashrae standard 62–2001. Ventilati on for acceptable Indoor Air Quality; American Society of Heating, Refrigerating, and Air-conditioning Engineers: Atlanta, GA, USA; 2001. Burge PS. Sick building syndrome. Occup Environ Med 2004;61:185-90. Norbäck D, Nordström K. Sick building syndrome in relation to air exchange rate, CO(2), room temperature and relative air humidity in university computer classrooms: An experimental study. Int Arch Occup Environ Health 2008;82:21-30. Lu CY, Tsai MC, Muo CH, Kuo YH, Sung FC, Wu CC, et al. Personal, psychosocial and environmental factors related to sick building syndrome in official employees of Taiwan. Int J Environ Res Public Health 2017;15. pii: E7. Apte MG, Fisk WJ, Daisey JM. Associations between indoor CO2 concentrations and sick building syndrome symptoms in U.S. Office buildings: An analysis of the 1994-1996 BASE study data. Indoor Air 2000;10:246-57. Erdmann CA, Apte MG. Mucous membrane and lower respiratory building related symptoms in relation to indoor carbon dioxide concentrations in the 100-building BASE dataset. Indoor Air 2004;14 Suppl 8:127-34.